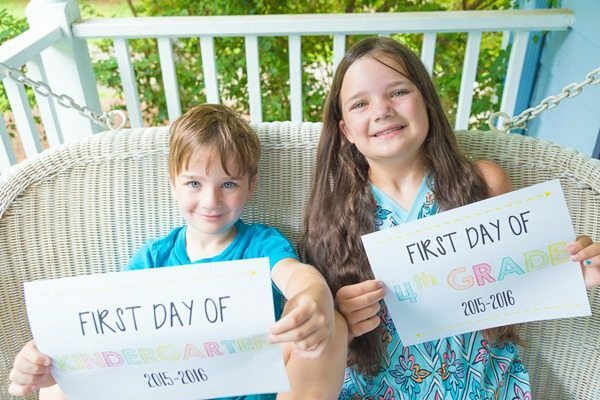 posted on August 15, 2016 by Rachel Callahan · 7 Comments Filed Under: Homeschooling: Not just for the socially awkward anymore. Last week, we did something I have constantly said I’d never do. We started school in early August. I’m just as shocked as you are. First of all, why would we do that? 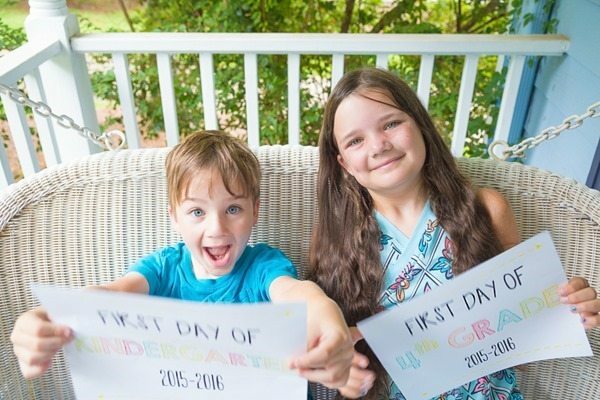 We homeschool so we should start school when God designed for school to start – after Labor Day. But more importantly, even if I did somehow feel the desire to start early, I’d never be ready for it, because I cannot think about school during the summer. 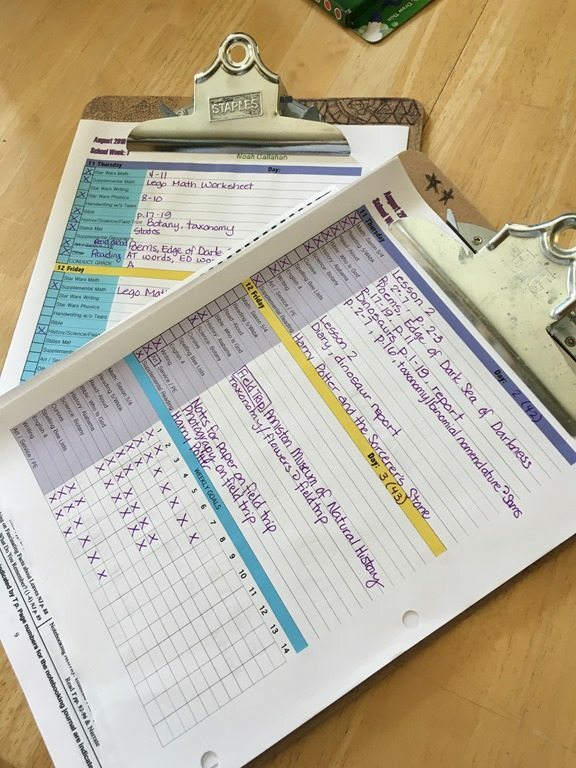 But somehow, this year, I found myself with approximately 65% of the motivation that I have always envied in more dedicated homeschool moms (I usually have around 8%.) I was regularly searching Pinterest for worksheets and ideas. 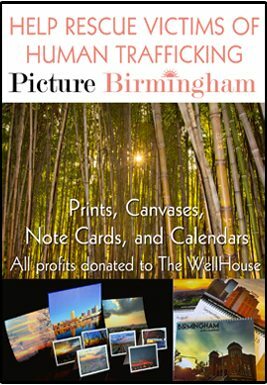 I spent an entire car trip creating an Alabama History spreadsheet – with a plan for the entire school year (more on that later this week.) I’d bought all my books by July. I’d spent two days rearranging my school room (formerly known as dining room.) And for some reason, I was actually excited about starting. And furthermore, my excitement rubbed off on the children. And they both asked if we could please start school early. So last Tuesday night, we returned to the place where we had our end-of-school family meeting, The Clock Tower, for a beginning-of-school family meeting. Chris got a bit sentimental, imagining that if we kept The Clock Tower as the location for all important family talks, one day Ali was going to ask us to meet her at the clock tower to tell us we were going to be grandparents. As he wiped a fake tear away, I told him he was getting WAY ahead of himself and to please focus. 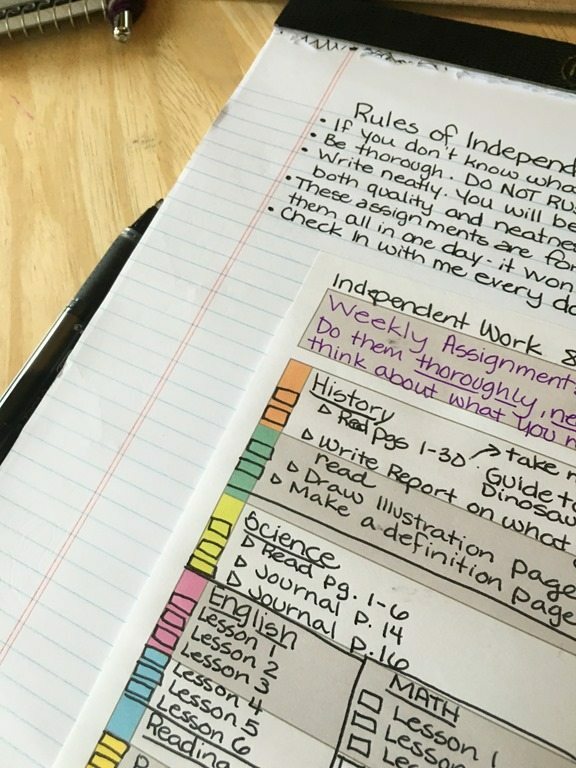 We reviewed the new rules for the new school year – bedtimes, iPad limits, rewards systems, and a strong encouragement to Noah to please, for the LOVE, participate in the act of education this year. And the next morning, we got up, bright-eyed and ready to learn. Okay not everyone was immediately bright-eyed. But even he couldn’t deny the excitement of true, legit Kindergarten status. And, shockingly, Noah was quite participatory for the first three days of school. 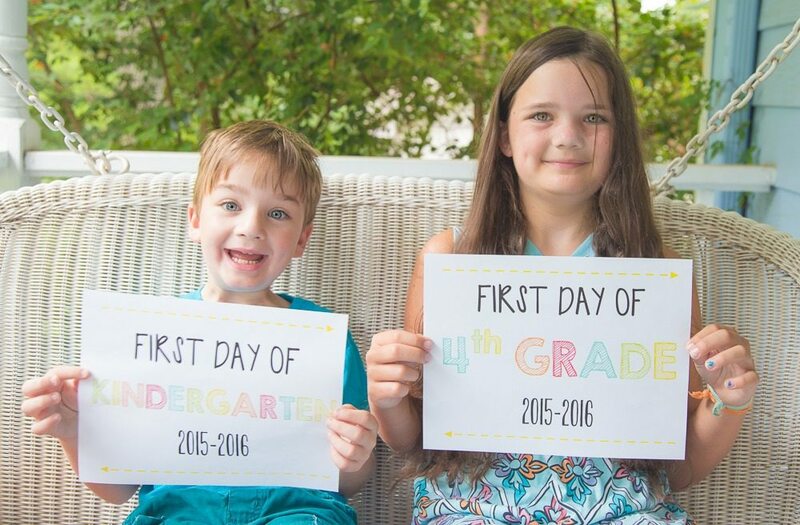 Ali actually struggled – not with school, but with emotions and not feeling as excited – totally out of character for her. I finally realized that the transition from Mom-Who-Doesn’t-Have-To-Parent-Her-Much to Teacher-Who-Reminds-Her-Constantly-To-Write-Neatly-And-Leave-Spaces-Between-Words can be painful to her perfectionist psyche. Hopefully she’ll be used to the new me – and realize that she’s not in trouble for leaving too little spaces between words – by next week. Which brings us to the importance of a good rewards system. I’ve been using the same rewards sheet the past few years, so I decided I needed something new, fresh, and more motivating. 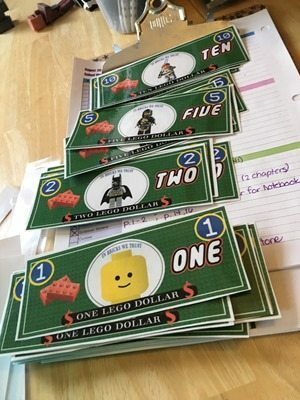 So I found a site online that had created Lego Bucks, so I printed and laminated a bunch. 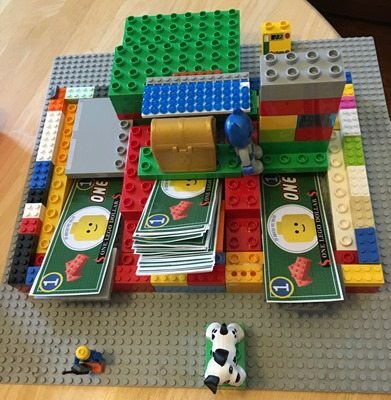 I asked the kids and Chris to please make me a banking system for my bucks, OBVIOUSLY out of Lego. The middle is the bank, the left is Ali’s account, and the right is Noah’s. The characters are the security guards. They’re doing a fantastic job. So far. Noah earns his bucks by being participatory, obedient, and not whiny during school – a feat indeed. I haven’t created the prize redemption sheet yet, but it’s sure to include candy, treats, and Doodle’s Ice Cream trips. But just the promise of prizes is enough at this point, so I’m milking that for at least two weeks. One of the problems we had last year was Ali’s frustration and inability to focus when I was working with Noah. 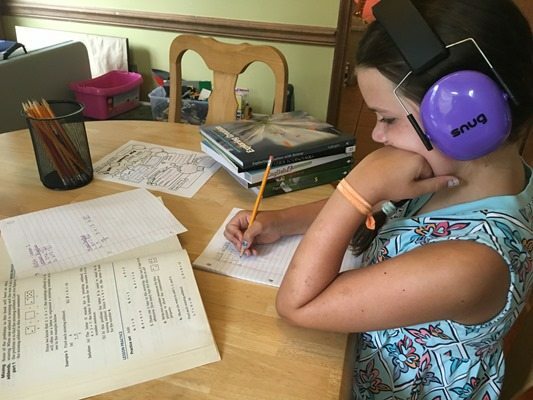 So this year, I bought her some noise-canceling headphones. Although they don’t block all noise, they seem to be blocking enough to be successful in their mission. As for me, I’m using my same homemade lesson planners, tweaked and doubled now to account for Noah’s differing subjects. Clearly they need more tweaking, as I LEFT THE READING CATEGORY OFF OF NOAH’S for week one. Geez I’m the worst. 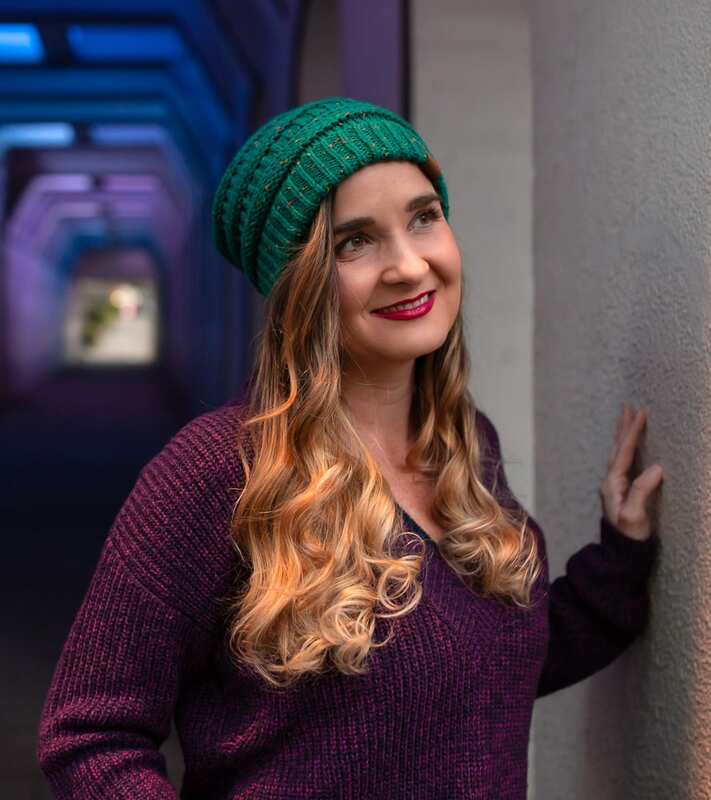 I’m giving Ali “Independent assignments” so that she can still do some things on her own time, and so that it separates what we’re going to do together so that she doesn’t get ahead of me. And she, like any red-blooded woman, LOVES to have her own checklist to feel accomplished and in general amazing. 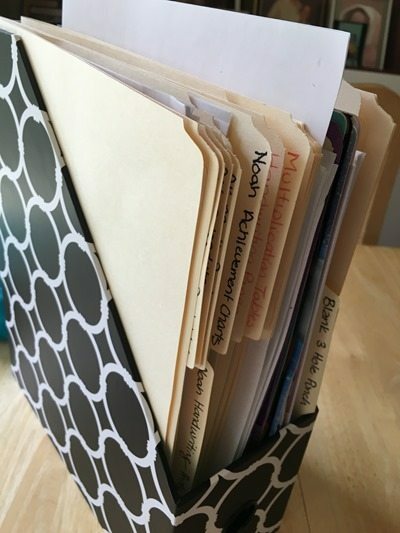 As for me feeling amazing, I’ve found that a Magazine Organizer is imperative to not having papers and files strewn all over my house. This stays on my table and holds completed work, future worksheets, paper, lined paper, and more. It’s like my own little secretary. As for what specifically we’re covering in school this year, I’ll share later this week. I’ve found some fun stuff, some boring stuff, and some very, very ambitious stuff…so we’ll see if my rare motivation lasts. Until at least February. Next Post The Nuts and Bolts of Education. Previous Post The Tale of Bugtussle. I’m feeling very unmotivated this year. 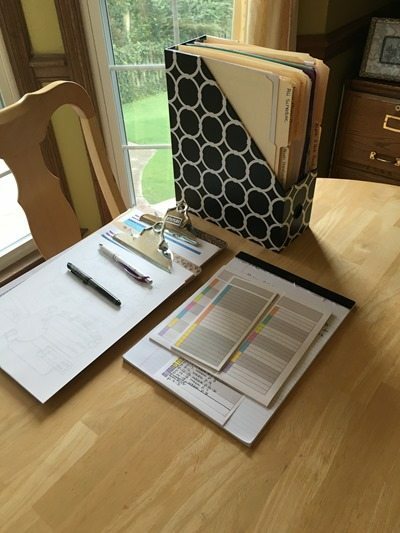 Partly because my daughter is in 9th grade and VERY independent now, partly because she is doing an online school for the second year, so my prep work is mainly getting the family calendar synched, her extracurriculars coordinated and paid for, and two 3-ring binders cleared out and relabeled. 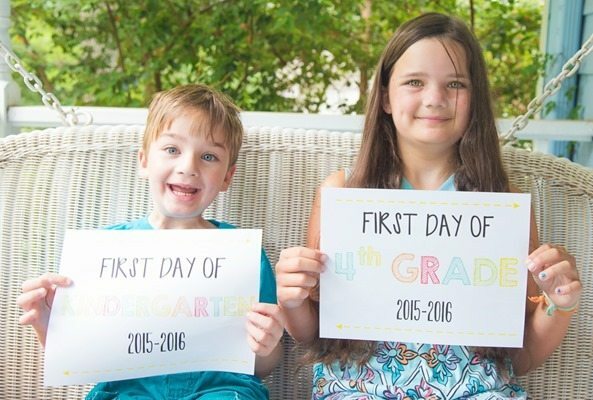 I do, however, need to coordinate our back-to-school photo shoot! And, I would be failing you as a friend if I didn’t point this out, you may want to go back and photoshop your photos, you’ve got the wrong year ! I noticed the year right away too. :-). We started the first day of August as well, because it’s nice to have the freedom to take time off for a field trip or quick trip to visit relatives. Plus, we finish school two weeks or more before the local public school. Our homeschooling grades this year are 6th, 4th, 1st and PreK. Whew! Today is our first day of school; I wanted to start in July so I could try a 6 weeks on, 1 week off schedule but that didn’t pan out so I was going to start August 1st but a church youth trip the first week followed by a family trip the next week changed my plans yet again. I have been wanting to try the 6 on 1 off since I started homeschooling but I don’t think it is meant to be sigh. I have a 8th and 6th grader this year and even though I had curriculum picked out before we even finished school last year, I don’t feel as ready as I would have liked, you are way more together than I am! I don’t homeschool, I should have because my oldest is very similar to your Ali and I am a teacher. She is entering 3rd grade and now in middle school level reading material. She read 6, 500+ page books in the first 3 weeks that school let up and she is active with swim team and just being 8 so I am not sure how she found the time. But she then spent the next few weeks after that telling me every stinking detail about those books so I have no question she read them! My youngest is 1 month older then Noah and she is entering Kindergarten. She has 0 motivation for anything related to formal education. She is not crafty and if asked to come and do a little school work, rewards and pleading will be involved until she finally comes over with an energetic “oh alright but not long”. 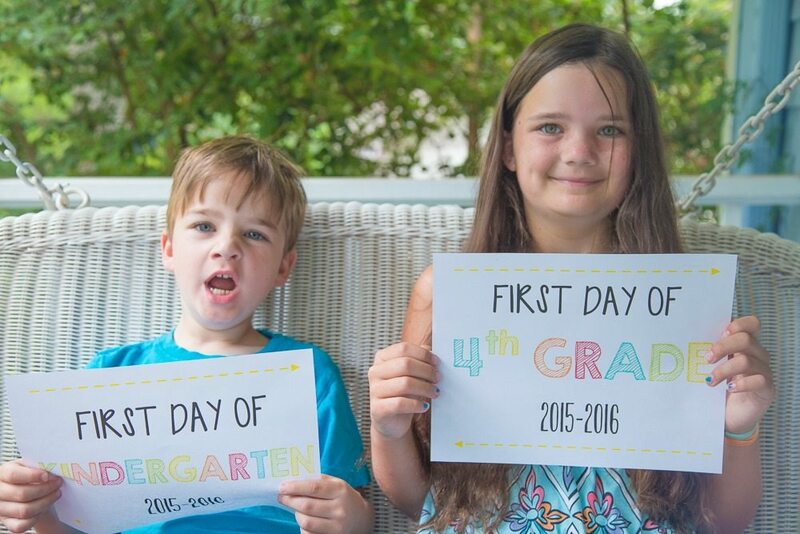 So I am nervous about Kindergarten. I work part time and have it set up so that she is going to a preschool after Kindergarten for an enrichment club but she will only be doing the recess and lunch part of that club since I can pick her up at 1. She is over the top excited about that part. When people ask her about Kindergarten she talks about lunch and playing on a playground, ha!